THE plastics mould and die industry is one of the most dynamic and vibrant growth sectors within the Malaysian manufacturing sector. With over 1,550 manufacturers, Malaysia is among the largest plastics producers in Asia. But the industry is expected to see a slight decline in 2012 with growth resuming in 2013, said companies interviewed at the recent M’sia Plas show in Kuala Lumpur. Now in its 23rd year, the Malaysian International Plastic Mould & Die Exhibition or M’sia Plas showcased the latest machineries brought by makers from China, Taiwan and Malaysia. Held 19-22 July, the exhibition occupied a space of 4,500 sq m at the Putra World Centre, Kuala Lumpur. China-based Yizumi Precision Machinery that specialises in injection moulding and die casting machines was at the exhibition hall showcasing its small and medium-sized equipment to prospects. The company is represented by WY Machinery Trading in Malaysia and has been providing sales, repair and modification services to the company’s growing customers in the country. According to David Seow, Assistant Manager of WY Machinery, there are about 200 clients of Yizumi in the country and its best sellers include the energy-saving injection moulding machine. “Yizumi is a well-known trademark and it is known for its reliability for its customers in China,” said Seow. “In Malaysia, it is also popular since the company has been putting a lot of effort to take part in exhibitions of plastics and foundry industries such as this one,” he added. Malaysia-based Zhian Her Machinery Enterprise manufactures screws/barrels, bag making machines, control systems as well as KTC and KTF linear motion position sensors and parts. Jim Yeh, a representative, showed one of the company’s cutting machines at the show. He said the machine is easy to maintain, is designed for high production and consumes lower energy, thereby reducing costs. He said sales have been a bit weak due to the cut in production rates for plastic bags. “Some plastic bag makers are reducing their production and people have also started to become more prudent when using plastic packaging. Customers are trying to cut down on packaging,” he explained. 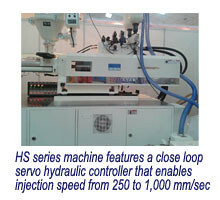 Improving energy savings is also one of the main features of the machines of Malaysia’s ESM Precise Manufacturing. Based in the Klang Valley, the maker uses its years of experience as well as partnerships and has developed an injection moulding machine that can save on energy consumption. “The energy-saving system of the ESM120 is specially developed for mould makers. It’s highly effective and can realise cost cutting,” said Susie Lee, Sales Manager. 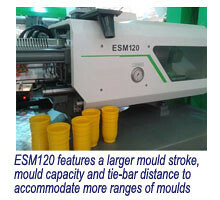 The ESM120 features a larger mould stroke, mould capacity and tie-bar distance to accommodate more ranges of moulds. It has a large volume mould memory to maintain dozens of mould data and parameters, to facilitate easy mould changes for customers, said Lee. She also said the machine has a newly designed oil and electric circuit that can meet the requirement of more precise production. She adds that sales of this unit have been successful through the help of marketing offices in Vietnam, Philippines, Sri Lanka, Indonesia and Thailand. Conserving resources and protecting the environment was the highlight at the booth of MPM Plastic Machinery, a joint venture company between Malaysian firm Mekahsa Plastic Machinery and Singapore-based Chuan Durn Plastic Industries. The company was formed to combine the experience and expertise of both companies in the research, design and manufacture of auxiliary equipment. 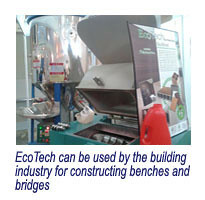 During the exhibition, the company displayed its EcoTech process using EcoPlas material, a composite of natural fibres, targeted at household and industrial. According to Sales Manager, To Teck Hoo, EcoPlas can be used by the building industry for constructing benches and bridges. “It’s ideal as a sound-proof and heat insulation material for residential and commercial building partitions,” he added. Expanding market presence is the agenda for China-based Ningbo Haitai Plastic Machinery with the company currently looking for a potential dealer in Malaysia. Established in 1992, the company makes injection moulding machines and has about 350 employees, most whom are technicians and engineers. According to Kevin Shen, Sales Manager, the company ships 70% of its production to more than 20 countries. In Malaysia, the company has sold 300 machines since 2010. Energy efficiency is the main selling point for most of the small-sized machines, which according to Shen have servo motors that enable energy savings of up to 80%. Taiwanese injection moulding machine maker Lien Fa Injection Machinery was also at the show to introduce its latest machines such as the HS series. According to Joe Chiang, Export Sales Manager, the machine features a close loop servo hydraulic controller that enables injection speed from 250 to 1,000 mm/second. “What’s interesting about this machine is that it delivers high output and quality. With a 6 to 8 second-mould cycle time, makers can increase production capacity and realise higher profit,” Chiang explained. The HS series is suited for moulding parts like tableware, beverage cups and CD case. Established in 1990, Taiwan-based Cherng Horng Machinery manufactures blown film machines, flexographic printing machines, bag making machines and recycling machines. “We have an experienced R&D team and this has led to a number of patents. Because of this we have launched various products such as blown film extrusion machines (mono and three-layer ones) for pallet stretch film and cling film, fully automatic rewinding machine for stretch and cling film and slitting rewinding machine,” said Kuo Ming Hsiang, Managing Director. 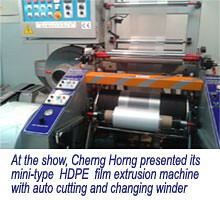 At the show, the company presented its min- type HDPE film extrusion machine with auto cutting and changing winder. “The design is simple but the performance is outstanding. Customers will find the machine user friendly and easy to maintain. Just perfect for volume production,” he said. The fully automatic machine is designed for the rapid rewinding of stretch film from jumbo roll into small rolls, meaning to say that a skilled operator is not required and one person can run up to three units, according to Kuo. Over 12 years in the industry, Taizhou Qiming Mould of China specialises in moulds for automotive bumpers, fenders, grilles, interior decoration and for water tank Based in Huangyan, the company exports its products to Taiwan, Iran, Pakistan, Malaysia, Japan, Thailand, Italy and Germany. The company currently has 180 people and the facility can produce moulds that are of up to 1,000 tonnes using CAD/CAE/CAM, 3D measuring machines, high-speed milling and CNC machining centres. According to Ma, the company can help clients from mould design to mould flow analysis and the end product.